(Generation M#3 (fb) - BTS) - A group of former mutants who lost their powers on M-Day formed a support group to discuss their tragedies. 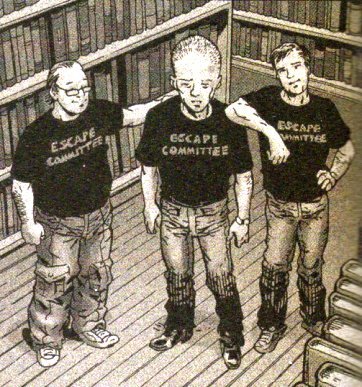 They donned T-shirts that read “Escape Committee” and garnered a name for themselves. 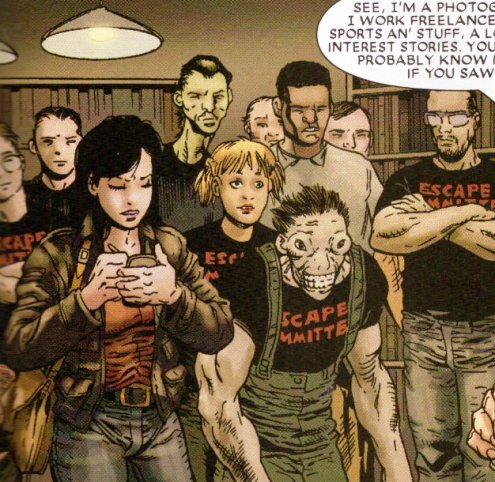 (Generation M#3) - At a meeting attended by members Ralph, Kevin E., Bertram K., Joey V., Elaine, Michael, and others, reporter Sally Floyd, writer of the Ex-Mutant Diaries, attended. After Ralph and Joey shared their stories, they quieted down Elaine, who only claimed to have had powers before. Sally later published an article on the group. Comments: Created by Paul Jenkins, Ramon Bachs and John Lucas. The name FOOM is obviously a parody of the old published book FOOM (Friends of Old Marvel) from yesterday. Kevin E. and Bertram K.
(Generation M#3) - Kevin E. and Bertram K. were pictured as members of the Former Order of Mutants (FOOM) in Sally Floyd's article. (Generation I#3 - BTS) - Ralph shared his story at a meeting of the Former Order of Mutants (FOOM) where reporter Sally Floyd attended. (Generation M#3 (fb) - BTS) - When Elaine's alien abduction support group disbanded, she pretended to be a former mutant super hero in order to join FOOM, the Former Order of Mutants support group. 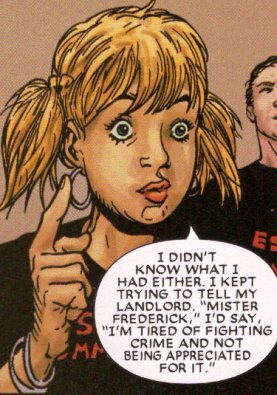 (Generation M#3) - Elaine annoyed the others by claiming to have lost her powers, stating that her landlord, "Mr. Fredericks", didn't believe her either. (Generation M#3 (fb) - BTS) - A former mutant with unspecified abilities, Michael was abandoned by his powers on M-Day. As his parents liked his powers, he felt pressure to keep pretending he had them. (Generation M#3) - Michael told his story at a meeting of the Former Order of Mutants (FOOM), a support group for ex-mutants, as reporter Sally Floyd watched. 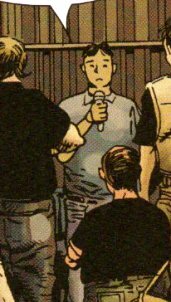 (Generation M#3 (fb) - BTS) - A former mutant with slight precognitive abilities, Joey V. used his powers to get great photographs of news events in Philadelphia. He developed minor fame as a freelancer and a small following. On the events of M-Day, Joey lost his powers and could no longer get good pictures. He relocated to New York City. 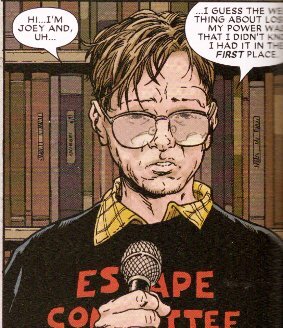 (Generation M#3) - Joey told his story to the others at the Former Order of Mutants (FOOM), a support group for ex-mutants, as reporter Sally Floyd watched. Before losing his powers on M-Day, Joey possessed minor precognitive abilities.